We began our journey into developing this range with a single product, our chilli jam – made with a medium dutch red chilli (approx. 30,000 Scovilles). This was soon added to in response to customer requests for hotter chilli jams and our products now span the Scoville Scale, right up to Carolina Reaper chilli jam – made with the hottest chillies on the planet. We have also added an allergen-free chilli jelly, which is great for using as a glaze as well as a condiment. Chilli jam is a savoury jam, so is used to accompany savoury dishes. Our award winning chilli jam is made using medium red chillies and we also make a hotter version with Scotch Bonnet Chillies for those who like a bit more heat. This is a wonderfully versatile preserve that can accompany cheese, cold meats, fish or burgers equally well. Alternatively add a spoonful to a stew or stir-fry to spice things up a bit! Chilli jam is a savoury jam, so is used to accompany savoury dishes. 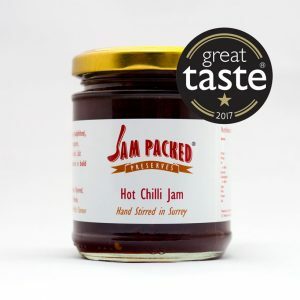 Our hot chilli jam is made using Scotch Bonnet Chillies, but we also make an award winning milder version with medium red chillies for those who prefer a little less heat. This is a wonderfully versatile preserve that can accompany cheese, cold meats, fish or burgers equally well. Alternatively add a spoonful to a stew or stir-fry to spice things up a bit! Our Hot Chilli Jam won one star in the Great Taste Awards 2017. The Judges Said: This is a punchy chilli sauce, tempered slightly with some sweetness. Judges liked the fact that this sauce carried both heat and flavour. Nice vibrant colour. Heat builds slowly, which works well rather than punching you in the face straight away. Chilli jam is a savoury jam, so is used to accompany savoury dishes. Our award winning Naga chilli jam is made using Naga (or Ghost chillies: Bhut Jolokia) and we also make hotter versions with Trinidad Scorpion and Carolina Reaper Chillies for those who like even more heat! 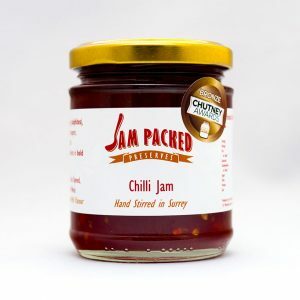 The Naga chilli has a wonderful sweet flavour and this chilli jam lulls your taste buds into a false sense of security before the full impact of the heat comes through. This is a versatile preserve that can accompany cheese, cold meats, fish or burgers equally well. Alternatively add a spoonful to a stew or stir-fry to spice things up a bit! 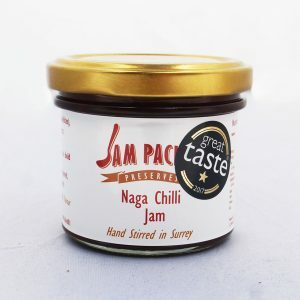 The Naga chilli jam won one star in the Great Taste Awards in 2017. The judges said: Gorgeous bright colour and good consistency, with visible chilli seeds. Hot on the palate but not bitter. It has a great finish. If you like it hot, you will like this! As the description reads, this is a very, very, very hot Chilli jam. It has a nice set and good colour. This tastes like a sweet chilli jam and then the explosion kicks in. Does what it says on the jar. 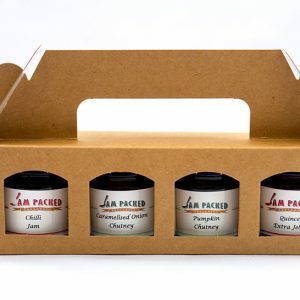 This pack contains 4 x 49g jars: 1 each of Chilli jam (award winner), Caramelised onion chutney, Pumpkin chutney (award winner) and Quince extra jelly. This pack contains 1 x 227g jar of our Chilli jam (award winner) and 1 x 227g jar of Hot chilli jam. Chilli jam is a savoury jam, so is used to accompany savoury dishes. Our award winning Trinidad Scorpion chilli jam is made using Trinidad Scorpion (or Ghost chillies) and we also make other hot versions with Naga and Carolina Reaper Chillies for those who like even more heat! The Scorpion chilli has a sting in the tail. This is a versatile preserve that can accompany cheese, cold meats, fish or burgers equally well. Alternatively add a spoonful to a stew or stir-fry to spice things up a bit! 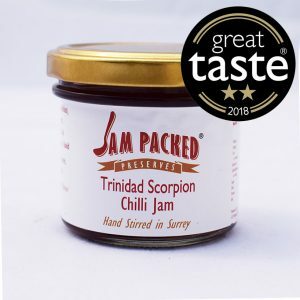 Our Trinidad Scorpion Chilli Jam won two stars in the Great Taste Awards 2018. The judges said: Yes this is hot, but not the purposeless blinding heat one might expect from a lesser product. A balanced sweetness and a heat that comes in gently and starts to build into a fiery delight make this sauce stand out above others of its kind. A good set, pleasant fruitiness, this has an intense heat but well balanced. Produced with skill and care.